What is new about Military Funeral Honors? How does a family request a grave marker? To whom can the family write to express comments or concerns about the Military Funeral Honors program? Burial benefits in a VA national cemetery include the gravesite, a headstone or marker, opening and closing of the grave, and perpetual care. Many national cemeteries have columbaria or gravesites for cremated remains. Veterans and service members are eligible for burial in a VA national cemetery, An eligible veteran must have been discharged or separated from active duty under conditions other than dishonorable and have completed the required period of service, Persons entitled to retired pay as a result of 20 years creditable service with a reserve component are eligible. A U.S. citizen who served in the armed forces of a government allied with the United States in a war also may be eligible A 1997 law bars persons convicted of federal or state capital crimes from being buried or memorialized in one of the VA national cemeteries or in Arlington National Cemetery. Spouses and minor children of eligible veterans and of service members also may be buried in a national cemetery. Adult children incapable of self-support due to physical or mental disability are eligible for burial. If a surviving spouse of an eligible veteran marries a nonveteran, and remarriage was terminated by divorce or death of the nonveteran, the spouse is eligible for burial in a national cemetery. Gravesites in national cemeteries cannot be reserved. Funeral directors or others making burial arrangements must apply at the time of death, Reservations made under previous programs are honored. Cemeteries do not provide military honors but may make referrals to military units or volunteer groups. The National Cemetery Administration normally does not conduct burials on weekends, A weekend caller, however, will be directed to one of three VA cemetery offices that remain open during weekends to schedule burials at the cemetery of the caller's choice during the following week. Arlington National Cemetery is under the jurisdiction of the Army. Eligibility for burials is more limited than at other national cemeteries. For information on Arlington burials, write to Superintendent, ArlingtonNational Cemetery, Arlington, VA 22211 or call 703-695-3250. The two active national cemeteries administered by the Department of the Interior are AndersonvilleNational Cemetery in Georgia and Andrew Johnson National Cemetery in Tennessee, Eligibility for burial is similar to VA cemetery eligibility. Cemeteries for veterans also are operated by many states. For burials in these cemeteries, contact the cemetery or the applicable state. VA provides headstones and markers for the unmarked graves of veterans anywhere in the world and of eligible dependents of veterans buried in national, state veteran or military post cemeteries, Flat bronze, flat granite, flat marble, upright granite and upright marble types are available to mark the grave in a style consistent with the cemetery, Niche markers also are available for identifying cremated remains in columbaria. Headstones and markers are inscribed with the name of the deceased, branch of service, and the years of birth and death. Optional items that may be inscribed are military grade, rank or rate; war service such as "World War 11"; months and days of birth and death; an emblem reflecting one's religion, and text indicating valor awards. When burial is in a national, state veteran or military post cemetery, the headstone or marker is offered through the cemetery, which will place it on the grave, Information on style, inscription and shipping can be obtained from the cemetery, When burial occurs in a cemetery other than a national, military post or state veterans' cemetery, the headstone or marker must be applied for from VA. It is shipped at government expense. VA, however, does not pay the cost of placing the headstone or marker To apply, complete VA Form 40-1330 and forward it to Director, Memorial Programs Service (403A), Department of Veterans Affairs, 810 Vermont Ave., NW, Washington, DC 20420. Forms and assistance are available at VA regional offices, For information regarding the status of an application, write to the Director, Memorial Programs Service (4MA), or call 1-800-697-6947, VA cannot issue a headstone or marker for a spouse or child buried in a private cemetery- Twenty-year reservists generally are eligible for a headstone or grave marker. To memorialize an eligible veteran whose remains are not available for burial, VA will provide a memorial headstone or marker, The headstone or marker is the same as that used to identify a grave except that the phrase "In Memory of" precedes the inscription. The headstone or marker is available to memorialize eligible veterans or deceased service members whose remains were not recovered or identified, were buried at sea, donated to science, or cremated and scattered. The memorial marker also may be provided for placement in a cemetery other than a national cemetery, In such cases, VA supplies the marker and pays the cost of shipping, but does not pay for the plot or the placement of the marker. Presidential Memorial Certificates express the nation's recognition of veterans' service. Certificates bearing the signature of the President are issued honoring deceased veterans with honorable discharges. Eligible recipients include next of kin and other loved ones. The award of a certificate to one eligible recipient does not preclude certificates to other eligible recipients- The veteran may have died at any time in the past. Requests for a certificate must be accompanied by a copy of a document such as a discharge to establish honorable service. VA regional offices can assist in applying for certificates. VA will pay a burial allowance up to $1,500 if the veteran's death is service-connected. In some instances, VA also will pay the cost of transporting the remains of a service disabled veteran to the national cemetery nearest the home of the deceased that has available gravesites. 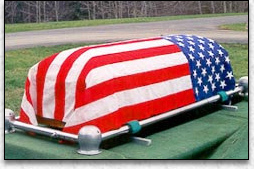 In such cases, the person who bore the veteran's burial expenses may claim reimbursement from VA. VA will pay a $300 burial and funeral expense allowance for veterans who, at time of death, were entitled to receive pension or compensation or would have been entitled to compensation but for receipt of military retirement pay. Eligibility also may be established when death occurs in a VA facility, a nursing home under VA contract or a state nursing home. Additional costs of transportation of the remains may be paid, There is no time limit for filing reimbursement claims of service-connected deaths. In other deaths, claims must be filed within two years after permanent burial or cremation. VA will pay a $160 plot allowance when a veteran is not buried in a cemetery that is under US. government jurisdiction under the following circumstances: the veteran was discharged from active duty because of disability incurred or aggravated in the line of duty-, the veteran was in receipt of compensation or pension or would have been except for receiving military retired pay; or the veteran died in a VA facility. The $150 plot allowance may be paid to the state if a veteran is buried without charge for the cost of a plot or interment in a state-owned cemetery reserved solely for veteran burials- Burial expenses paid by the deceased's employer or a state agency will not be reimbursed, For information on monetary benefits, call 1-800-827-1000. Depending on their circumstances, military veterans and their dependents are entitled to a variety of benefits beyond these burial benefits. Contact should be made to the Veterans Affairs Office to determine what benefits can be claimed and then gather the information required. The National Toll-free Number for the Veterans Affairs Office is 800-827-1000. Military Funeral Honors have always been provided whenever possible. However, the low now mandates the rendering of Military Funeral Honors for an eligible veteran if requested by the family. As provided by low, an honor guard detail for the burial of on eligible veteran shall consist of not less than two members of the Armed Forces. One member of the detail shall be a representative of the parent Service of the deceased veteran. The honor detail will, at a minimum, perform a ceremony that includes the folding and presenting of the American flag to the next of kin and the playing of Tops, Tops will be played by a bugler, if available, at by electronic recording. Today, there are so few buglers available that the Military Services often cannot provide one. Any person convicted of a Federal or State capital crime sentenced to death or life imprisonment or in flight to avoid prosecution. The Services requests at least 48 hours in order to organize the funeral honors detail.